'The little blue bach' is a super cute, retro yet tidy old school beach house. Fully fenced, pet friendly, and a back lawn perfect for pitching a tent. Short stroll to dairy for ice creams, cafe for coffee and fish n chip shop nearby. 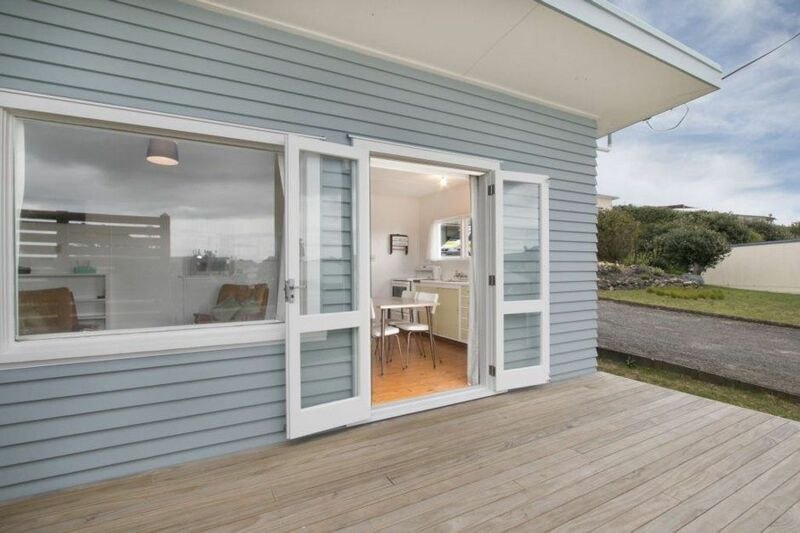 Only 3 minutes walk (200m) from beautiful Waihi Beach, and a little bit further along to the permanently dog friendly stretch of beach all the way to Bowentown. Also handy to the Bowentown cycle path. Dog friendly, but please do advise in booking request. Off street parking available inside the property behind the house. We loved that we could easily walk to the beach and that a dairy was just down the road. Really enjoyed our stay and would stay again. A few mins walk to the beach. Perfect small space for a short stay. Has all the basic essentials. Quick and considerate communication with the owners. Thanks for a lovely stay. A cute Bach with the basics needed for a weekend stay. Awesome to find somewhere we could bring our little dog. Oven didn’t work though which was a little frustrating when we had bought food to cook. Other than that we had a good stay. Thankyou. I'm so sorry you had trouble with the oven. It does work, it just needs to have the time set before it will work. I will add this to the Bach Information sheet for future. The location couldn’t be better - right around the corner from the beach and down the road from a dairy and nice fish and chip shop. Short drive to the shops. The Bach is a classic Kiwi Bach just what we wanted and it is clean and tidy, fenced and dog friendly. Basic bach in a good location close to the beach. Basic bach in a good location close to the beach. Great that it is dog friendly.